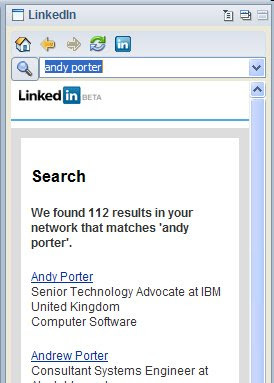 It automatically enters that name into the LinkedIn sidebar application and returns a search matching the name (I had to manually edit the "J" our of my name since it does not appear in my LinkedIn profile). Clicking on my name in the search results brings up my profile in the sidebar. So if I receive an email from a partner or customer it is that easy to find their LinkedIn profile and understand. There is still a little bit or work to do on the installer (you can't just drag it into your widgets sidebar yet) and I'm not sure if it will be released as a standalone plugin or as part of maintenance release but it is going to be well worth the wait. Great Stuff! Does this require Connections or just the ND8.x client? Hi Ed. In this case I am just using Notes 8.5. The Lotus Connections integration is separate. Is this integration a widget and is it publicly available? @telvox Yes it is a widget. Not yet public and I'm not sure when it will be released.